Hair loss has been proven to come as a result of many factors, but can smoking weed cause hair loss? What exactly is the relationship between marijuana and hair loss? Well, we’ll find out later in this article as we’ve decided to give you a definitive answer to this question. We understand that there already a lot of articles out there related to this topic, but a lot of them are just scratching the surface. In this article, we’re not only going to answer this question, but we’ll also back up our answer with enough data and studies. Can Smoking Weed Cause Hair Loss? It might interest you to know that two-thirds of Americans witness some level of hair loss by the time they are 35 years old. About 85% of American men also have significant hair thinning by the time they are age 50. Hair loss continues to be a global concern as more people continually find themselves on the list of persons with one form of baldness or the other. A lot of people who suffer from hair loss are also said to be unhappy with their situations. Though quite a number of hair loss cases have been traced to androgen effects, the actual cause of other forms of hair loss remains a puzzle as some are seen as probable causes. However, one culprit that has been identified for centuries is smoking. But what type of smoking is capable of causing hair loss? Studies have shown that cigarette smoking can cause hair loss just like smoking of marijuana. But are these studies conclusive? Can we depend on them to say that loss of hair is a product of tobacco and weed smoking? Well, we shall look into each of the theories put forward by the researchers and see how they are linked to hair loss. 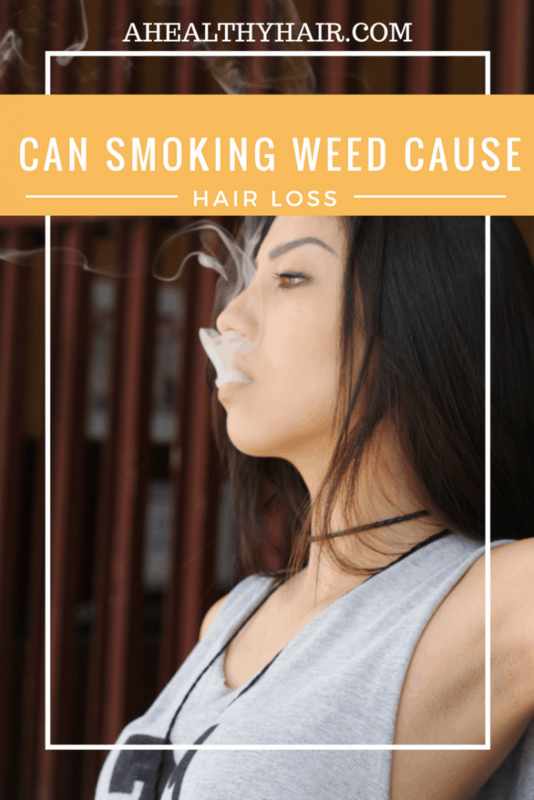 If you smoke weed, you are at a higher risk of losing your precious hairs as studies have shown that smoking weed causes hair loss. I know that your question would be how can smoking weed cause hair loss? We will try to explain this based on a number of studies conducted in that line. As you may already have known, these two hormones play a significant role in producing testosterone. When there is a reduction of the hormones, this also results in a lower level of testosterone in the body. It is, however, possible that prolonged use of marijuana can lead to fewer symptoms and stabilization in the level of the affected hormones. This happens as the body develops tolerance but that is not to say that chronic use of marijuana prevents the aforementioned symptoms. The body produces the hormone, cortisol in response to stress (whether physical or mental). Tetrahydrocannabinol (THC) is capable of increasing cortisol level in the body. With the increase in cortisol level, this can trigger a condition referred to as telogen effluvium. Usually, the growth of hair takes place in three phases – anagen, catagen, and telogen. When the hair follicles prematurely enter the telogen phase, it is referred to as telogen effluvium. This can be triggered by illness, injury, stress or hormonal changes. This can usually result in the excessive shedding of hair. The good news for people who suffer from telogen effluvium is that it is not a permanent condition; it goes off once the stress is taken off. But if the THC is not discontinued, the telogen effluvium remains. The production of new cells is critical as far as the hair growth cycle is concerned. The development of cells is a crucial component of the anagen phase. A 2007 research performed by the University of Debrecen showed that endo- and exocannabinoids hinder hair follicle growth in human. Cannabinoid receptors are found in different parts of the body and play some roles in various physiological processes including pain sensation, memory, appetite, and mood. The body has the ability to secrete its own cannabinoids, referred to as endocannabinoids. But the type of cannabinoid that marijuana produces is known to as exocannabinoid. Just like the endocannabinoid, the exocannabinoid can attach itself to the cannabinoid receptors found in the body. In other words, cannabinoids have the power to hinder hair shaft development and growth and also stimulate loss of hair in humans. This is made possible by increasing the hair percentage in the catagen phase. With an increase in exocannabinoids, the rate of hair follicles in catagen phase equally increases. Weed smoking is not the only type of smoking capable of causing hair loss, tobacco smoking also does. A report by the US National Library of Medicine shows that tobacco does not only create a significant number of deaths in the general population but also causes unpleasant effects on the skin. The report further said that some studies had shown a link between smoking and baldness. But how does that happen? The mechanism behind smoking leading to hair loss is made up of several factors. It is highly believed that genotoxicants from smoke can damage the DNA of the hair follicle. It is also thought that smoke can alter the microvasculature of the dermal hair papilla. During the growth phase of hair, smoke can cause an imbalance in the follicular protease/antiprotease systems which are in charge of remodeling the tissue. Can Anti Dandruff Shampoo Cause Hair Loss? Does Ketoconazole Stop Hair Loss? Can Antibiotics Cause Hair Loss? Dry Scalp Vs Lice – What’s the Difference? Another way smoking causes hair loss is through the pro-oxidant effects of smoking which bring about the release pro-inflammatory cytokines thereby causing micro-inflammation of the follicles and fibrosis. There is also the issue of increased oestradiol hydroxylation and slow down of the enzyme aromatase thereby leading to a state of hypo-estrogen. However, some research shows that the incidence of hair in cigarette smokers is made higher if the person has a family history of baldness. But smoking up to 20 sticks of cigarette per day increases the chances of becoming bald. If you love to have hairs that keep growing and maintain its sheen, it is advisable to keep off weed smoking as it is capable of slowing down hair shaft growth as well as increasing loss of hair. Since hair loss can potentially reduce your self-esteem, one good way to maintain your self-esteem is to stop smoking weed and tobacco. They easily produce unpleasant results on your hair. Good to know about your website as well 🙂 I covered a similar article on whether smoking weed causes acne.